Ron McBurnie was born in Brisbane and studied painting and printmaking at the Queensland College of Art 1976-78, was awarded a Diploma of Teaching in 1979 from Kelvin Grove College of Advanced Education, and a Graduate Diploma of Art at Queensland College of Art in 1989. He taught at Townsville College of TAFE from 1980-90 and since then at James Cook University. He began work on 'A rake's progress' in 1989, completing it the following year. The idea began as a joke, a suburban Brisbane parallel of Hogarth's' Rake's progress' of 1735 and David Hockney's 'Rake's progress' series (1961-63). The series consists of eight etchings in an edition of 30; 10 folios numbered 1-10/30 (the Gallery has number 8), one artist's proof folio and one publisher's proof folio. 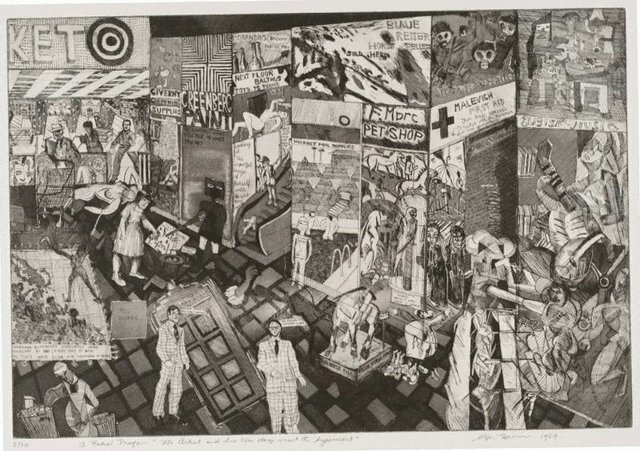 The Gallery also has 'The artist and his two dogs visit the Hypermarket' (diptych), an earlier special proof for the series. "I have always detested the notion that people think the same way, eat the same food, listen to the same music. One of my phobias related to the idea of losing my own identity within the similarities of the suburbs. My etchings are based within this mundane context but gain flexibility through the inclusion of the bizarre, the accidental and the humorous. The prints are small statements about the variety of life within the repetition of suburbia". 'The inheritance or the barbecue' relates specifically to Hogarth's first etching, also titled 'The inheritance'. Instead of referring to a financial inheritance as in Hogarth however, McBurnie is referring to an Australian suburban cultural inheritance - in this case, the barbecue. It depicts a wake following the burial of a parent (on the table by the food is an urn containing the ashes of the parent, an idea that came to the artist from other people's stories about their loved ones ashes), and the coming of age of a child (the Rake). As the series progresses, the Rake becomes the Artist, who simultaneously observes and participates in the narrative of the images.